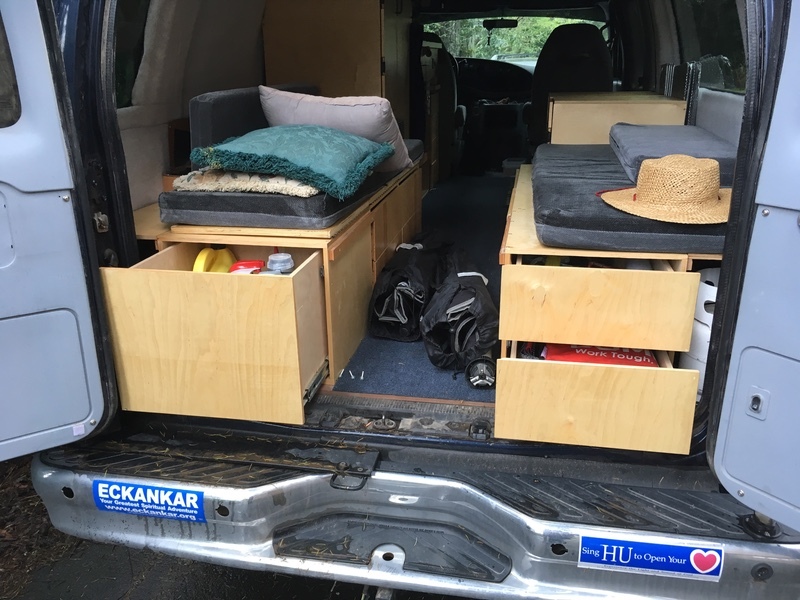 Im looking for ideas for a rear drawer setup, Looking to still utilize the rear cargo area behind my rear seat. Post up your setup. Here's a quick shot of my non Sportsmobile rear drawer. 48" deep mounted in a removable platform. Here are a couple pictures of my setup. Basically one giant 3'x3'x1' drawer with plastic bins. Slides are rated for 250lbs. Front face of the drawer is on hinges so once I pull it out it folds down to make a little table. 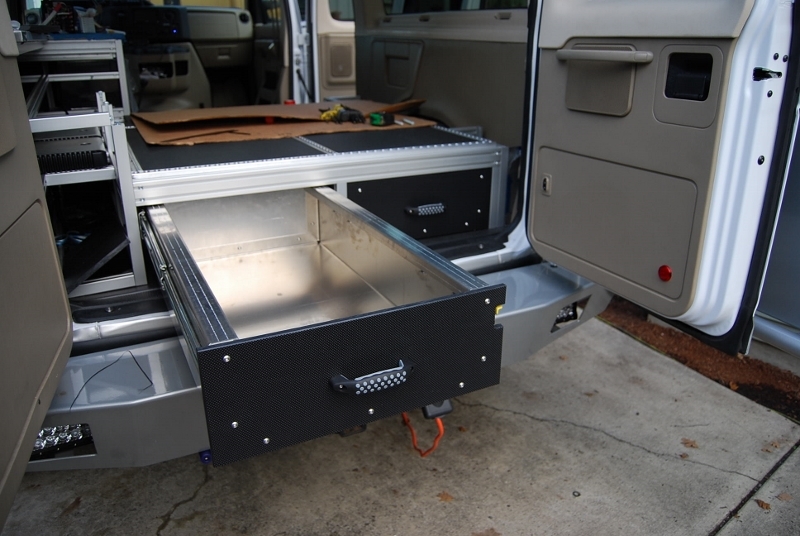 I can fit all my camping gear in that one drawer plus my axe, jack, battery buddy and air compressor. 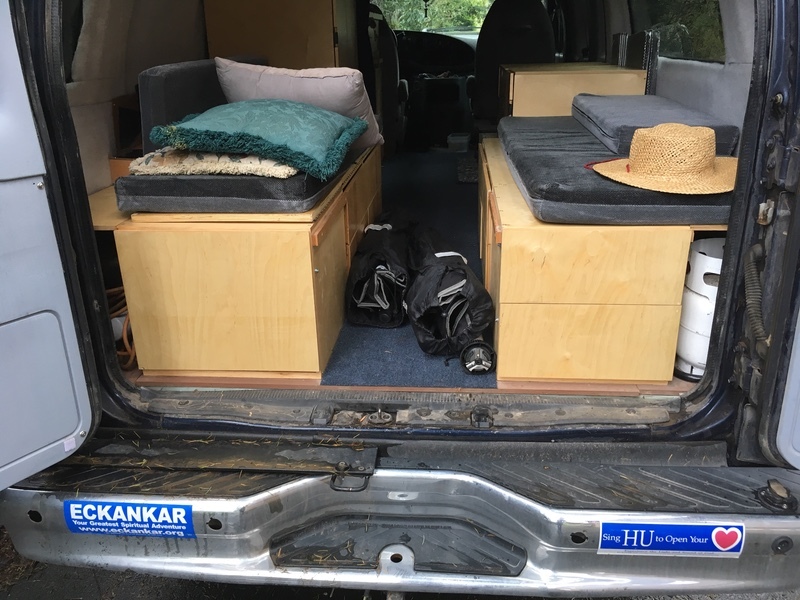 We built a dinette layout with three drawers facing to the rear. The drivers side hold spare parts and fluids. 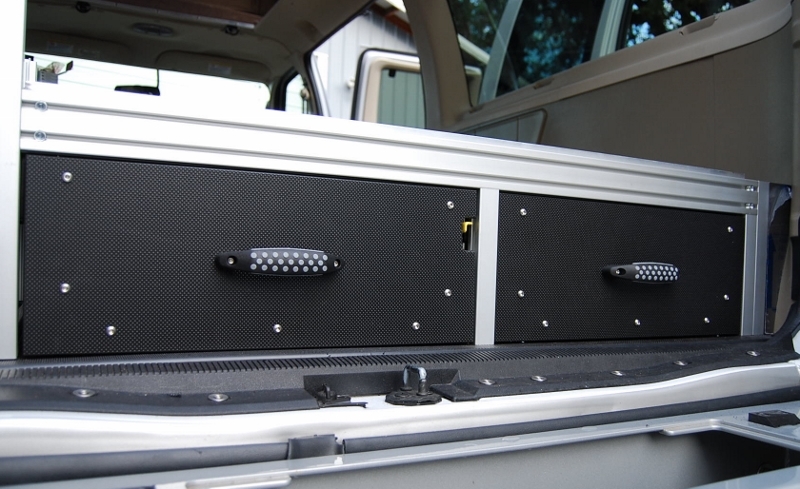 The top passenger side holds miscellaneous stuff and the bottoms one holds the recovery gear. They are about 18” deep and 16” tall/wide. thats really nice, SMB Bed? No, its actually an electric tri-fold bench seat that I pulled out of a '95 conversion van that was in a junkyard. Got some gray vinyl slip covers made for it and then cut off the most rear panel swinging arms and just leave the 3rd pad resting above the drawer. I went a different path. Instead of drawers, I used 12”x12”x12” boxes from Shopko or other department stores that I can pull out and carry around. I divided the area under the bed into a front half and a back half. The back half is my “basement” where I store jacks, tools, etc., and my 3 boxes with smaller items. The two narrow shelves above the boxes are for my small tent and van’s awning. I divided the front half under the bed into two layers for my wife’s supplies & clothing. For her I got 12”x12”x6” and 12”x6”x6” cloth boxes from Shopko to store things in. This photo shows one layer and she has another layer of just as many boxes. They slide in and slide out easily. For her the biggest problem was remembering what she put in each box, so I made her a spreadsheet printout that she could consult. Coming to see you if I ever decide to redo my interior - you have skills!